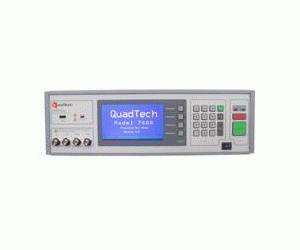 Fast and accurate swept parameter measurements, graphical or tabular, for verification of component and material response to changes in ac test frequency, ac test voltage or ac test current, without the need for complex programming or an external controller. Test setups can be stored on and recalled from either internal memory or the USB memory stick. Measured data can be stored on a memory stick and then transferred to PC for data reduction and analysis. Load correction substantially improves instrument accuracy by performing measurements on a known standard and applying the correction to subsequent measurements. Ideal for repetitive testing of identical devices at like test conditions. The 7000 can be calibrated without returning the unit to the factory using the NIST traceable QuadTech Calibration Kit, reducing down time and calibration costs. Large LCD graphics display and user friendly menu driven interface allows the 7000 to be put on line quickly, providing useful measurements by operators with little to no training.